Quarrying drastically alters the relief and hydrology of the site, and completely removes the soil, the vegetation and the associated microorganisms and fauna. 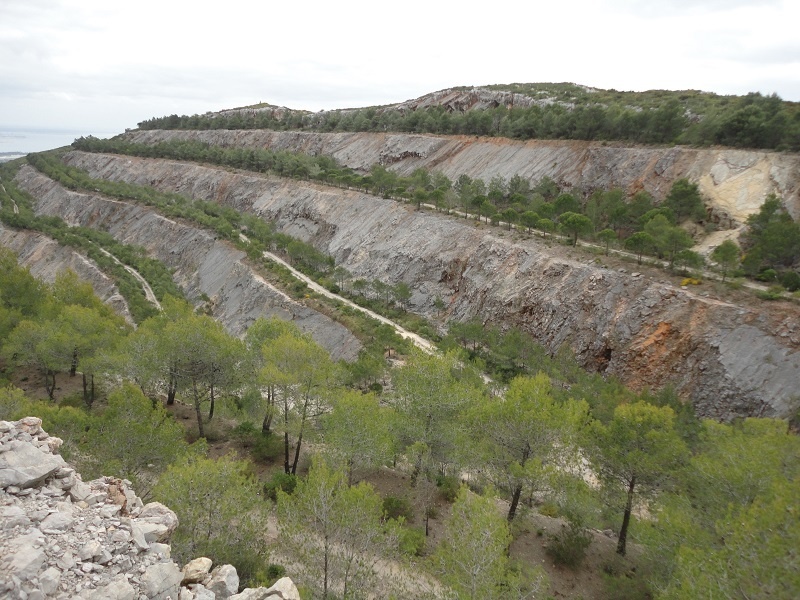 Adding to the constraints imposed by Mediterranean climates, these limitations must be overcome to achieve the successful of quarries such as the one at Outão (Serra da Arrábida, SW Portugal). Efforts to revegetate this limestone quarry were initiated by Secil (cement company) in 1983. Until 2008, the top-to-bottom excavation of the hill face produced a stair-like sequence of terraces. On each terrace, substrate (marl spoils) was laid, and woody species planted (mostly from the local flora) soon after excavation stopped. Since 2002, the new bare areas were designed as slopes instead of terraces. To prevent erosion and favour stabilization, slopes are hydroseeded (with herbs and small shrubs), and then planted with native woody species. The temporal evolution of revegetated areas – by comparing the present characteristics of areas of different ages but where similar revegetation procedures were performed, as well as with their characteristics as monitored in 1998. The cost-effectiveness of different revegetation procedures – by comparing the characteristics of areas subject to different revegetation procedures (g. terraces vs. slopes). The short-term characteristics of recently revegetated areas – by monitoring the establishment and survival of the plants introduced by seeding and plantation. The results are expected to indicate: (i) the level of success of the various studied areas, (ii) the need for adaptive management actions (in older areas), and (iii) the need to change current procedures (e.g. the species or densities used), aiming at the full ecological integration and long-term sustainability of the new plant community. SECIL, Companhia Geral de Cal e Cimento, S.A.